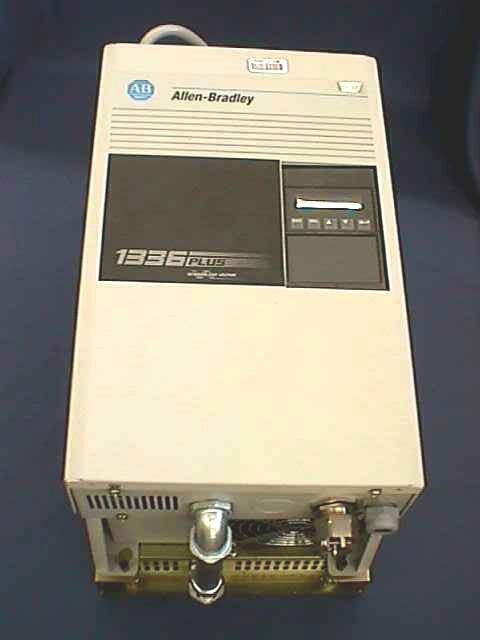 Adjustable frequency AD drive ALLEN BRADLEY 1336S (13336 PLUS - model B015-AE-DE4). Drive 380-480V / 15 HP with input filter RFI. Control by sine coded PWM with programmable carrier frequency. Efficiency: 97.5%.Output Voltage Range: 0 to rated voltage. Output Frequency Range: 0 to 400 Hz. Frequency Accuracy Digital Input: Within ± 0.01% of set output frequency. Analog Input: Within ± 0.4% of maximum output frequency. Selectable Motor Control:Sensorless Vector with full tuning. Standard V/Hz with full custom capability. Accel/Decel: Two independently programmable accel and decel times. Each time may be programmed from 0 - 3600 seconds 1 in 0.1 second increments. SPECIFICATION: Const Torque: Input kVA 16-21; Input Amps 25; Output kVA 19; Output Amps 24.2; Variable Torque: Input kVA 18-23; Input Amps 28; Output kVA 22; Output Amps 27; NEMA 1, IP20. Power 14KW.